ipe Band Plugs� provide high-quality hearing protection reducing noise levels and harmful frequencies whilst maintaining clarity of sound. Pipe Band Plugs� are re-usable, soft, comfortable and simple to fit with transparent silicone fins and an integrated high fidelity filter membrane. Chris Stout & Catriona McKay return with release of their long awaited duo album 'Bare Knuckle'. The music is almost entirely self penned especially for this recording. It's a fresh new sound for this duo who have now been performing and recording all over the world for 20 years. Having recorded several albums in collaboration with other artists in recent years, it is actually a staggering 7 years since this awe inspiring pair released their last duo album. The critically acclaimed White Nights. Andante Tenors are constructed similar to the Bass and are remarkably light. There are 14 tension screws on each head. This makes it easier to achieve even tension throughout the entire surface of the head. Damping fitted and tuned by a meter. 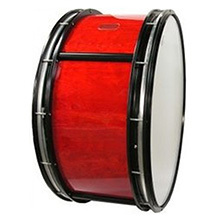 The Tenor Drum has a carrying handle and hook combined. This makes the drum easy to carry by hand. Andante Tenor drums are designed to produce a sound that is in harmony with the drone section of the bagpipe, balancing the overall sound of the band thus enchancing the ensemble. Consist of 2 x 3ply layers of Birch strengthened with a 3ply Birch reinforcement ring giving increased response and brightness of tone. Easy to tune, features a new top tension ring profile with a 20 screw helicoil tension system, to tighten head evenly thus producing a clear sound and reducing the risk of head damage. Tough oven baked powder coated paint finish. Rigorous quality control checks at each stage of production ensures the continuity of excellence and reliability. 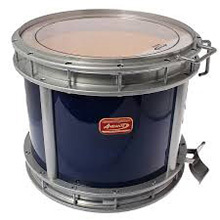 The Andantes Bass Drums are constructed with four lightweight alloy extrusions retaining a non-porous acrylic or wooden shell which makes the drum extremely light and easy to carry. There are 14 tension screws on each head. This makes it easier to achieve even tension throughout the entire surface of the head. Damping fitted and tuned by a meter. 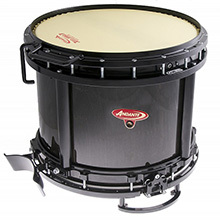 Andante Bass drums are designed to produce a sound that is in harmony with the drone section of the bagpipe, balancing the overall sound of the band thus enchancing the ensemble. 60 Popular Dance Tunes suitable for younger players. Compiled by Barbara Wood. First part of tune noted on one side of the page and second (easier) part of tune for second instrument is on the opposite side so two musicians can harmonise together (2 parts + ABC chords). We introduced this reed protector for our blackwood chanter range due to a common problem where the top cracks. It is very important to break down the chanter and allow the hemp to dry out. If this is not done it can cause the top to crack. This reed protector features extra holes at the top allowing the reed to be safely stored in a pipe case while the chanter dries out after playing.